Before you answer, I don’t mean the nearly 4 weeks of frantic shopping or the crazy parties or the frenzied family gatherings or the warm, gushy feelings we get from receiving presents. I mean the real reason why we do those things in the first place. In truth, there is so much more, and we need to rediscover what this meaning of Christmas is. Although Jesus is the Reason for the Season is a catchy slogan, I would like to propose that the Holy Family is the reason for Christmas. This is not to deny that the Second Person of the Trinity is the linchpin for this holy day, but we have to remember that He could have come onto our planet in any number of ways. He could have arrived upon the clouds with lightning or with a fireworks display. Instead, He chose to enter our world in the most natural, most human institution: a man and woman, united in marriage. Why did God choose to come to earth this way? I believe it had everything to do with getting our attention in a very subtle way. God created humanity, and even though we have a track record of doing some pretty stupid, evil things, He never abandons us. Indeed, “For God so loved the world that he gave his only Son, that whoever believes in him should not perish but have eternal life” (Jn 3:16). He has no intention of giving up on us, but wants to fulfill the very reason we were created. What exactly is that? In a word, love. We were created to love. While the media and all the Christmas decorations may attempt to play on our sappy emotions with the sentimental nature of Christmas, Christ came to reveal that real love is about making a sincere gift of self. We are to pour out our lives to others. Love came to earth to die, to give everything of Himself so that we may have life. That’s right, that cute little baby boy born in a manger two millennia ago was destined to have nails driven through his hands and feet. For us. Today. While it’s true that Jesus in his divine nature knows all about love because He is Love, we cannot simply whitewash the fact that because Jesus was also 100% human (remember, He’s true God and true man), He had to learn about human love from somewhere and someone(s). That somewhere was during the silent time in his home in Nazareth, hidden away from public eye. 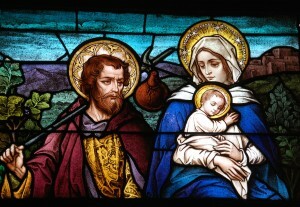 And those someone(s) were Mary and Joseph – one sinless, and one a sinner with incredible virtue. It was in the home of Joseph and Mary that Jesus learned the meaning of love. From the moment of his divine conception, he was received as a gift. Jesus would grow up seeing how Joseph treated Mary, how he interacted with others, how committed he was to taking care of his family. Jesus watched Mary, the most pure of all women, the one whom He had selected from all eternity interact with her husband, of how she fulfilled Proverbs 31 before his eyes. Through their love, He witnessed how their marriage and family life quietly impacted the lives of those around him. 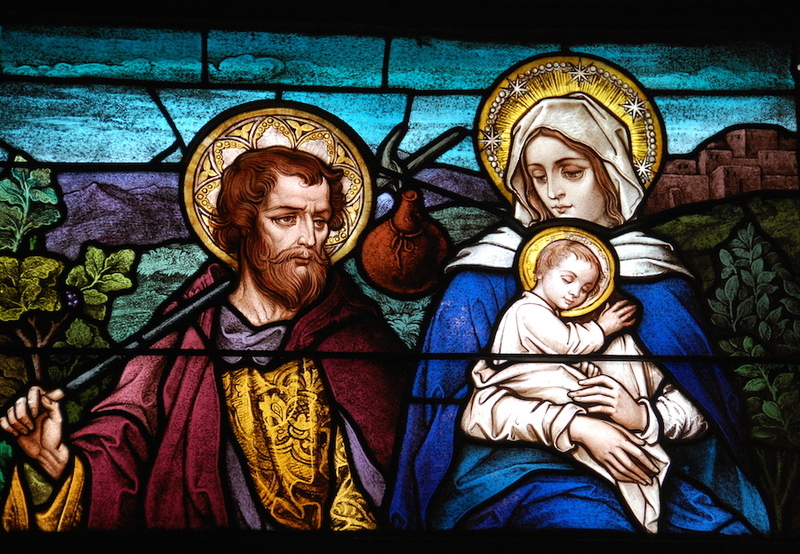 It is vitally important for our culture that we return back to contemplating the Holy Family, for today, the family, founded on the institution of marriage, is under attack. So many people have experienced brokenness in their families growing up. Their families as adults are not much better. Instead of trying to discover what God’s plan for the family is, there is a movement to try to redefine the family to whatever we want it to be. Yet this is a mistake. Although our family may not be like the Holy Family (call me if yours is – I want to take notes), and we might be really dreading getting together with the in-laws for Christmas evening dinner, we have to remember that within our gaping wounds and brokenness, God is truly present. When we experience difficulties, we have to remind ourselves that the problem isn’t our family. The problem is not opening ourselves up to His grace and allowing Him to truly be made manifest in midst of our struggles. This is what Jesus Christ came to do. He is Immanuel – God with us. He’s not afraid of the mess and stress. In fact, He Himself was a crisis pregnancy – mother unwed, no insurance coverage, no hospital, and a government trying to kill him. Thus whatever difficulty we find ourselves in, we must not give up but trust in this Person who wants to help us carry our cross. This Advent season, as we are making preparations for the coming of Christ, don’t focus on the problems nor on what we might be lacking. Instead, give thanks, because we’re blessed to share in the poverty of Our Savior who came on that cold Christmas night. He has come to walk with us through our struggles, to give us the strength and grace to love those who are often most unlovable…and that includes ourselves.